The first step in any project that takes place high off the ground is deciding what kind of scaffold or work platform you’ll use to get the job done. Usually scaffolding can safely hold workers, but you might need other types of lifts for your materials, such as general lifts, material hoists, or industrial elevators. Continue reading if you’re interested in examining the different types of hoists. Standard scaffolding may do the trick if you’re washing a third story window, but getting materials up to the top of a skyscraper is a different story. Hoists and lifts, which are also known as construction elevators, help with this part of the equation. General hoists and lifts are versatile platforms that transport people, tools, or other materials up to a mid- to high-rise level. There are several different types of lifts, and their capabilities vary depending on the type you choose. Heavy-duty lifts can hold thousands of pounds, so consider your project’s needs. Sometimes referred to as boiler hoists, material hoists are not permanent structures. They are temporary lifts, and they’re used to lift the materials necessary to complete the project. Like general lifts, material hoists come in different sizes and configurations. Larger material hoists can transport thousands of pounds of cargo, while smaller hoists are more compact and can be helpful in confined spaces. Again, the right kind of lift depends on what you need it for. If you’re looking for extra safety and protection from the weather, an industrial elevator might be the type of hoist you need. These elevators are customizable and will keep people and materials safe from the elements, even when working in extreme environments. This degree of additional safety can go a long way. Are you having trouble finding the hoist you’re looking for? Call Scaffold Resource at (301) 924-7223. It’s our job to provide your business with the right work platform for the job, and our specialties include both shoring and scaffolding serving Washington, D.C. Visit our website for details about our products and services. Scaffolding is an elaborate system of tubes, clamps, connectors, and platforms. When it’s put together properly, it’s safe for workers to access elevated work areas, and even to bring equipment up to the platforms. One of the reasons why scaffolding is strong and sturdy is the use of the rosette and the rosette wedge. The rosette is a connector piece that looks like a disc with a handful of cut-out shapes around it, and the rosette wedge fits into this piece. Rosettes and wedges are found in system-style scaffolding. This is a sophisticated and innovative modular system that allows workers to quickly assemble and disassemble the pieces. To use the rosette wedge, all a worker needs to do is align the rosette with the wedge head. Then, the wedge is placed into the top of the wedge head. To secure the connection, the worker taps the wedge with a hammer to insert it properly into the rosette. Are you interested in buying or renting system scaffold? Call Scaffold Resource in Washington, D.C. at (301) 924-7223 or visit us online to learn more about our system scaffolding . Scaffolding rentals are an essential tool in the construction industry. They allow workers to work at heights from elevated platforms. There are two main types of scaffolding. Supported scaffolds are erected with poles or frames, and suspended scaffolds are held in place by overhead support. Watch this video to learn more about the basics of scaffolding and fall prevention. You’ll discover the importance of rails and barriers in fall prevention, along with the necessity of choosing scaffolding that is capable of supporting the weight of the workers and any needed equipment. In the Washington, D.C. area, Scaffold Resource is widely known as the leading provider of top-quality construction scaffolds . Call (301) 924-7223 with your questions about our tube and clamp scaffolding. The construction and engineering industry can be perplexing to people who are unfamiliar with the lingo and standard safety protocols. 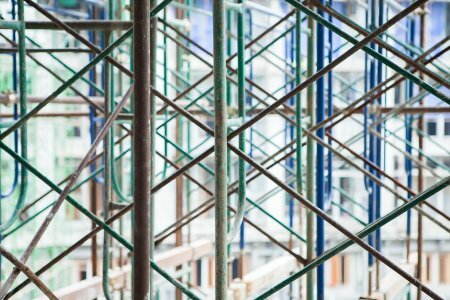 Scaffolding and shoring systems are terms that are often confused, but they’re two distinct systems. With either system, it’s essential to follow strict safety protocols to protect the workers and passersby. Scaffolding is a strong, sturdy framework that is built next to a building or other structure, such as a bridge. Within the framework, there are work platforms placed at varying heights and locations to enable workers to access different areas for construction or repair purposes. Scaffolding is a temporary structure built solely for the purpose of elevating workers, materials, and equipment. Like scaffolds, shoring systems are also temporary. However, they’re intended to support the building or bridge, not the workers. Shoring systems are made of heavy-duty modular steel components. Each load-bearing leg is able to support between 50,000 and 490,000 pounds. Structural shoring is used during construction, renovation, and demolition projects. It’s an essential tool for tasks such as bridge repairs. Since the shoring system holds up the weight of the structure, workers can safely perform repairs without risking the shifting or caving of the structure itself. Safety is always a concern at construction sites. It’s essential to choose a scaffolding installation team with the right training and credentials to safely assemble and disassemble the structure. Fall prevention guidelines must be followed to prevent serious injuries and deaths. Shoring systems are engineering marvels. To make it as safe as possible, the engineer must consider factors such as the ground conditions, load factor, environment, and dimensions of the structure before designing the shoring system. Safety is our top priority here at Scaffold Resource. It’s one reason why our expert team of construction scaffold installers in Washington, D.C. is in such high demand, and why we’ve been trusted to work on some of the nation’s most treasured landmarks. Call (301) 924-7223 to discuss our shoring systems and building scaffolds. 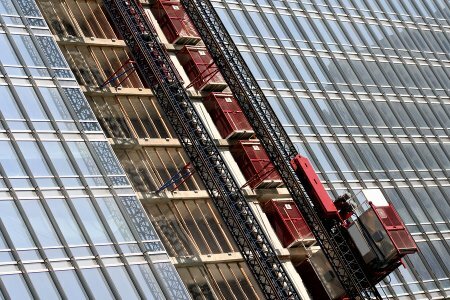 Some businesses use scaffold rentals on only an occasional basis, such as window washers and historic building restoration experts. Because of the infrequency of the business’ scaffolding use, their employees might not necessarily have the proper knowledge and skills for scaffolding work. Before an employee can perform any work on scaffolding, he or she must complete a training course. OSHA regulations state that employees should be trained by a qualified person before they can perform any scaffolding work. There is no specific certification necessary to be considered a qualified person. However, OSHA defines this person broadly as one who has successfully demonstrated competency and problem-solving abilities regarding scaffolding work. The demonstration of a qualified person’s abilities may be in the form of professional standing, a certification, or a recognized degree. It may also be attained through one’s experience, knowledge, and extensive training. 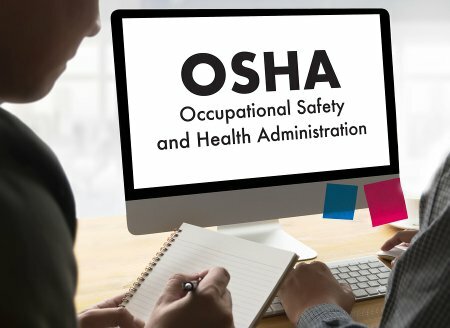 OSHA doesn’t require employees to earn a certification. However, it is good practice to retain training documentation. Additionally, compliance officers will assess competency by inspecting the rigging, observing work practices, and interviewing employees and supervisors. 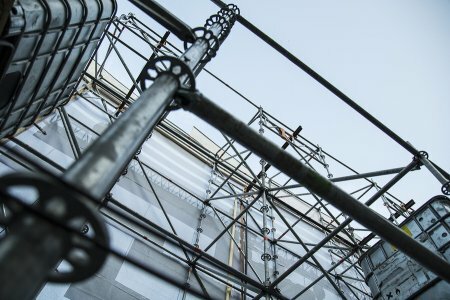 OSHA states that employers who suspect that an employee is not sufficiently skilled or knowledgeable to manage scaffolding-related risks should be retrained. Over a recent, three-year time period, Scaffold Resource achieved a rare milestone: 1.6 million man hours worked without any loss time injuries. Our unmatched commitment to ongoing safety training makes us the natural choice for companies who need to train their employees on scaffolding safety in Washington, D.C. Call (301) 924-7223, and be sure to ask us about our free monthly scaffold hazard awareness training.